BIG I TRI-COUNTY offered an informative and very timely breakfast meeting on ‘Agency Perpetuation’ at the Hyatt Place in Garden City on April 17. Agents came from as far as Brooklyn and Queens to hear John Biasello of Sukay & Associates, give a frank discussion on the thinking behind agency perpetuation and the current landscape in our downstate area. John’s experience and talk were extremely impactful. He focused on the advantages and disadvantages of both internal and external perpetuation, which drew many questions from the audience. View The Power Point Presentation Here! If you missed this one, please check our website – bigitricountyagents.org periodically for the next meeting! 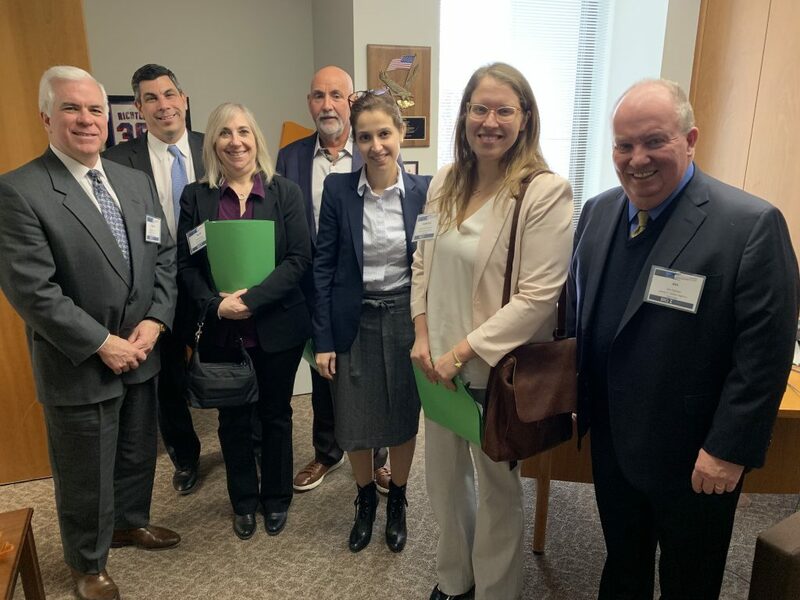 On Tuesday, March 5, a team of 10 from the Big-I Tri-County headed up to Albany to discuss pressing issues in the insurance field with several lawmakers in our districts. We discussed topics including – The single payer health system proposal in NYS; Amendments to the Workplace Safety & Loss Prevention Program; Removing the 30-day notice requirement for policyholder withdrawal from NYSIF; WC policies; Repealing the anti-arson law and Section 3411 of the Insurance Law regarding auto photo inspections. We received a lot of great feedback from Senate and Assembly members and their staffers and the exchanges were very informative. Overall, the day was a huge success! Wow!! – What a great time everyone had at TRI-COUNTY’s “Winter Cheer” event held on Feb. 11th at K-Pacho in New Hyde Park. Tasty hors d’oeuvres and plenty of drinks were enjoyed by all at the Cocktail Hour, while listening to live music and being entertained by Strolling Magicians performing Jaw-Dropping close-up magic. Kingstone Insurance Company, our honoree, was then recognized as the “Insurance Company of the Year”, and the accompanying award was presented to them. A wide ranging delicious Dinner Buffet was served, followed by a fun filled Stage Show of Magic and Mentalism, and more superb live music. Networking was happening throughout the evening in this warm and relaxed atmosphere between fellow agents, Insurance companies, vendors, and sponsors; both solidifying existing relationships and forming new ones. All this taking place during our thoroughly entertaining and enjoyable TRI-COUNTY “Winter Cheer” event. On July 25th, the Big I TriCounty Board of Directors volunteered their time and cooking skills to prepare a beautiful dinner at the Ronald McDonald House of Long Island; an establishment that provides housing, and other resources, for families with sick children, so they can remain close to each other during their time of need. Under the direction and guidance of our own “Chief Chef” Chris Wukovits, he and a few able bodied members of the board departed for Restaurant Depot early in the afternoon to purchase all of the food and supplies needed to prepare nearly 100 meals for the Ronald McDonald House guests. Once transported and unpacked, we were all given a tour of the RMH facility. We all were very impressed by the level of commitment that went into creating such a comfortable environment for the families of children undergoing critical treatment and procedures at nearby hospitals and medical centers. After the tour, members of the TriCounty Board began showing off their slicing, dicing, sautéing and grilling skills. Thanks to our “Grilling Guru,” Ron Brunell, the sweet aroma of marinated grilled chicken started filling the air. All others worked diligently to prepare sausage and peppers, beans, a mixed salad, along with sliced watermelon and platters of gourmet cookies for dessert. As they say, many hands make light work, and everything came together at the 6 o’clock hour when the dinner bell rang out. All of the children and their families enjoyed the dinner and complimented us on how well everything was presented and how tasty the food was. They were so appreciative of all of the hard work and energy that went into the meal preparation. It was an incredibly rewarding experience to donate the food, and to give our time, working as a team, to provide a home cooked meal to the children and the families currently residing at the Ronald McDonald House. We hope that we were able to bring them just a little bit of enjoyment and happiness during their incredibly stressful and challenging time. For many years, Big I TriCounty has offered the following awards for furthering education. This year we received more than 250 applications from high school students in the TriCounty membership counties of Nassau, Suffolk, Kings and Richmond. The following 2 applicants were selected, and awards were presented at their high school awards ceremonies this spring. Checks for $1,000 will go to their colleges for educational expenses as they pursue their goals. 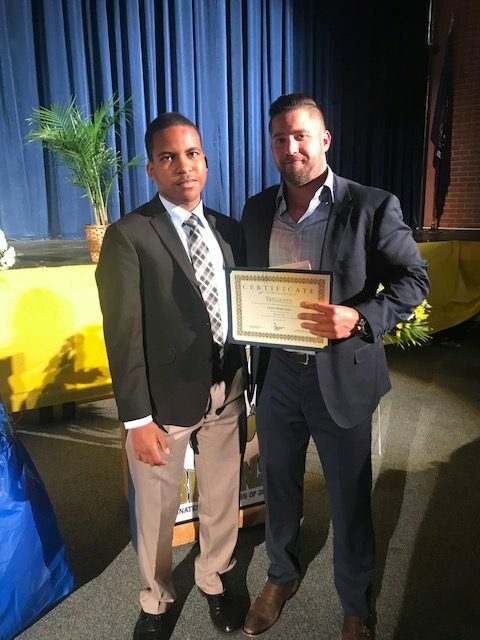 I was given the opportunity to attend “Awards Night” at Baldwin High School and present the Stephen T. Dooley Community Service scholarship award to a young man by the name of Colin Lamar Robinson. The scholarship is awarded to a student who displays exemplary efforts in community service. Colin devoted countless hours to various charities and was well deserved with this honor, edging out many impressive submissions. Colin plans on attending St John’s University this fall. Congratulations to Colin and all the other bright students who took home various awards and scholarships that evening. On Wednesday, May 30, I presented the Joel S Pollack Memorial Scholarship award to Vinny Pagano, of Long Beach High School. It was a really special night, especially for Vinny, as he received a number of awards and scholarships. I was really impressed with his essay on distracted driving, and it was an honor to present this award to him in recognition of his beautiful and insightful writing. This event was very nostalgic for me and brought me back to being in high school during these awards nights. I remember it as being exciting and my being proud to have my name called to accept the award in front of my peers and family. I am so happy to have been a part of this for Vinny. He definitely deserved it! 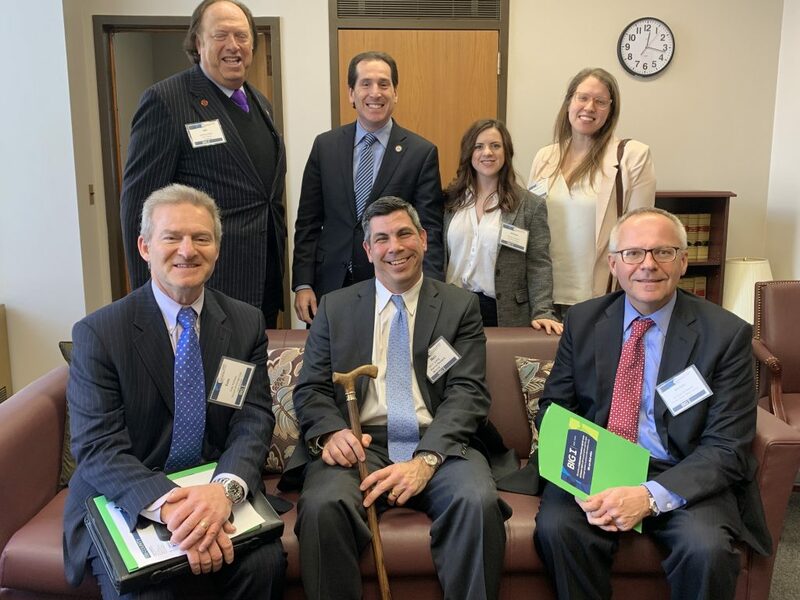 On Tuesday, March 6th, 2018, local Big I New York association delegations from all over New York State descended on Albany to meet with local legislators to advance the business of insurance and voice our support for some legislation, our concern and objection to others both “old” and “new”.“L Day” had been on a 4-year hiatus and thankfully it was revived for 2018 by the Big I New York. They provided support to all the local association such as TriCounty Independence Agents and Brokers with specific information regarding making appointments with both Senate and Assembly members of the Insurance Sub-Committee.I am proud to say of the 50 or so agents that came to Albany on that sunny Tuesday morning, TriCounty had the largest group which consisted of 7 Board Members and two association members who took the time to come to Albany and have our collective voice heard.We were one of, if not the largest group in attendance and it was suggested we also had the most scheduled appointments with 12. As the Chair of the TriCounty Legislative Committee, I was blessed to have such an outstanding group of professionals accompanying me to Albany.We methodically divided up the list of appointments and then split off into two groups and made our way up and down the elevators and in most cases the stairs of the Legislative building where our lawmakers have their offices.My group also had what is called an “off the floor” meeting with an Assemblyman.Here is how that works…,you go to the Assembly Chamber and get the attention of the Sargent of Arms who is at the door and provide him your business card and tell him you have an appointment with the Assembly member and he will go in tell the member and eventually the member will come out into the hallway to meet with you.I was amazed at all the other people and groups waiting to do the same thing!We even saw members of the NY Farm Bureau dressed in jeans, boots and a cowboy hats waiting have their say. Now let me tell you about the issues we discussed with the Senate and Assembly members who represented Nassau, Brooklyn, Queens and Staten Island.When we meet with the legislator or their top aides we advised them that we want them to support specific bills such as the Increase in Payroll Threshold for Workers Compensation for Employers subject to the Work Safety Program, Consolidating the License Renewal Dates for Business Entity’s and our opposition to the Governor’s proposed Budget item which would have increased the fines for insurance agents from $1,000 to $10,000.All of them agreed with these common-sense issues and committed their support.I am pleased to report that our efforts made a difference because that item was not in the final budget proposal.However, we did receive opposition to our support of the reform or repeal of the Absolute Liability Standard in Labor Law 240 & 241 affectionally known as the “Scaffold Law”.This topic was labeled the “third rail” by a Senate member meaning no one wants to touch it!The other main topic we addressed with our legislators was the proposed Single Payer Health System.Support of opposition to this plan is divided down party lines with many members in favor and about the same amount opposed.The outcome is uncertain, but the Big I oppose a Single Payer system as it would hamper competition, disrupt a vibrant marketplace that already exists and could adversely affect the quality and or cost of the coverage and care offered. 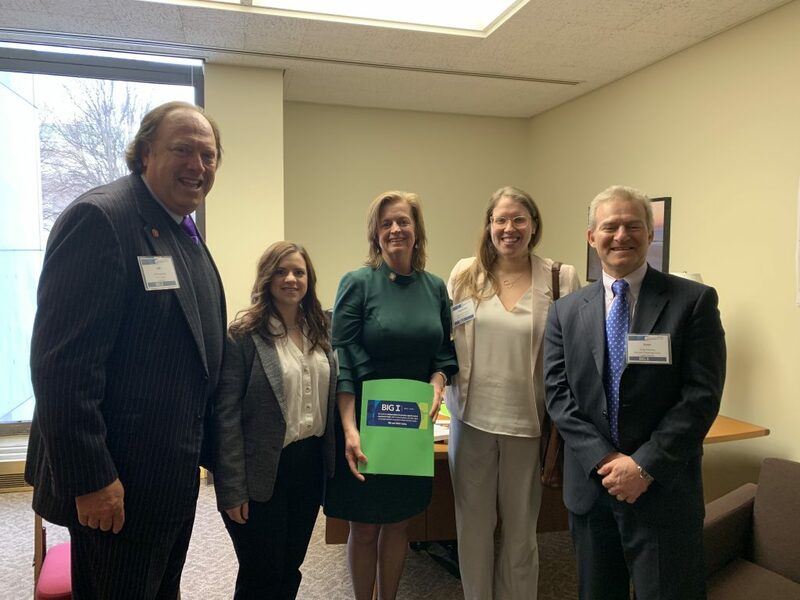 The Big I New York and TriCounty will continue to support legislation and positions that benefit our members and industry and strongly voice our opposition to current or proposed legislation that will harm our industry and clients.